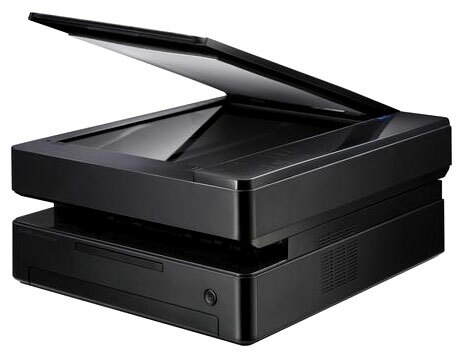 The Samsung SCX-4500 is a strikingly sleek laser multifunction printer designed for personal or home office use. It features a very small footprint, an aesthetically pleasing design heavy on right angles, and monochrome print, scan, and copy support in a package smaller than most single-function consumer devices. It doing so, it compromises a number of features, performing them at lower resolutions and lower capacities than other similar models. In short, by paying a premium for the SCX-4500, more than anything else, you're paying for looks, not function. The SCX-4500 measures 13" by 15.5" by 6.5" and weighs 18.9 lbs, making it small enough to fit on a desk alongside other equipment, on its own table, in a cabinet, or upon a credenza without any inconvenience. The unit produces copies or prints at speeds of 17 pages per minute on Letter paper and 16 pages per minute on A4 paper. Both the printer and copier produce prints at a resolution of 600 dpi by 600 dpi, significantly lower than newer consumer laser printers' speeds of 20+ sheets per minute and resolutions of 1200 dpi. It can process plain paper, thin paper, recycled paper, OHP, label, card stock, thick, and bon paper on media sizes A4, A5, A6, Letter, Executive, ISO B5, and JIS B5. The copier has a reduce/enlarge rate of between 50% and 199%, considerably smaller than other copiers' standard 25%-400%. However, it does produce up to 99 copies per job like most printing. The scanner supports WIA and TWAIN-based scanning and can perform color scans on its flatbed. It scans documents at resolutions of 600 dpi by 2400 dpi optically and enhanced scans at 4800 dpi by 4800 dpi. It lacks many features offered by other multifunciton units, however, and will only scan to PC. Direct to email, to FTP, and to other mediums are not offered. The copier has a maximum input capacity of 100 sheets and an output capacity of 30 sheets, considerably lower than other consumer printers. The printer connects via USB 2.0 and includes 8MB of RAM, which cannot be expanded. Many newer models offer network capabilities and much higher memory capacities. The printer supports Windows operating systems from Windows 2000 onward, many flavors of Linux, and Mac OS X 10.3 onward. The unit offers none of the advanced functions offered by newer consumer laser products at this price point. It has no LCD, requiring that all settings be changed and monitored from a PC connected to it. It has no options to expand its very small paper input and output, effectively disqualifying it from office use completely and totally. 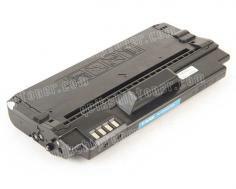 Its memory cannot be increased, it supports very few media sizes, has no fax options, and no paper finishing options, not even automatic duplexing (which is increasingly available on low-end printers). All of this points to the fact that more than anything else, purchasing the SCX-4500 is an aesthetic decision more than a functional one; this is a particularly good looking printer, but beyond that it lacks almost any functionality and anything to help make it a better value. The built-in 100-sheet paper tray does not match the color scheme of the rest of the SCX, making it both necessary and aesthetically less pleasing than it could be. The printer only supports SPL, Samsung Printer Language, meaning that PostScript applications, such as old DOS-based software, may be unable to print via this printer, as may older Mac OS-based systems. Like almost all printers, a USB cable is not included with this one, requiring the purchase or use of one that you already own. While this isn't necessarily a drawback, it is an inconvenience worth noting. 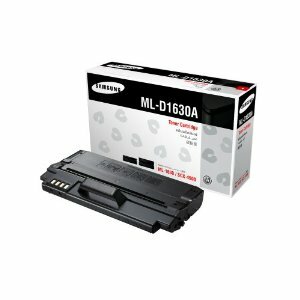 Review it: "Samsung SCX-4500 "
The SCX-4500 includes a single toner cartridge rated at approximately 1000 prints at approximately 5% coverage. Replacement cartridges yield 2000 sheets at approximately 5% coverage. Cartridges include a drum unit, meaning that replacement costs go up, but the amount of maintenance necessary in order to maintain proper printer function goes down, as both the drum and the toner will be replaced simultaneously by design.